HostPresto! > Help > Email > General > What are my Email Server Login Details? You can find your email server login details either in your welcome email or by going into your cPanel account login. However, as a quick reference, you should find that your details are similar to the following. However, please note the required replacements for your email account information. 'Username': This will always be your full email address. 'Incoming Server': For SSL, this will be prefixed with your server name and always followed by 'enixns.com'. For non-SSL, this will always be 'mail.' followed by your domain name. 'Outgoing Server': Again for SSL, this will be prefixed with your server name and always followed by 'enixns.com'. Again for non-SSL, this will always be 'mail.' followed by your domain name. If you have forgotten your email account password, please see 'How to Change your Email Password' for assistance. 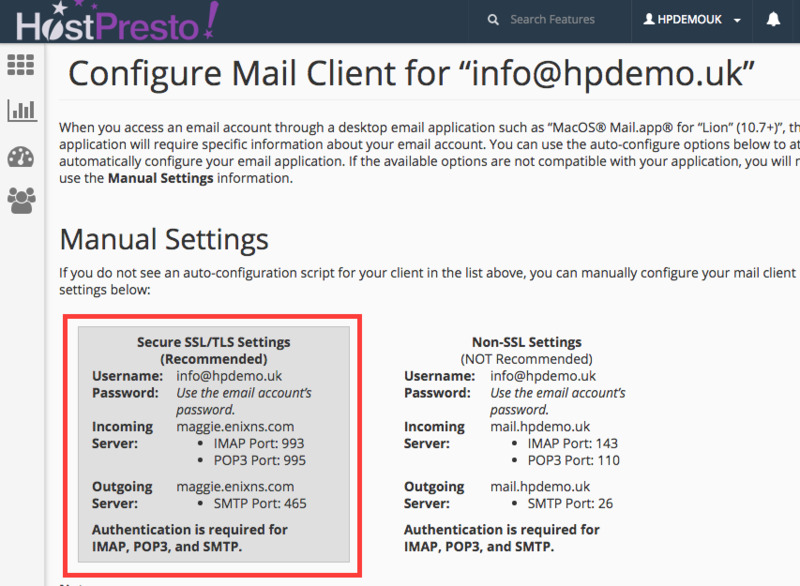 Need Help Setting Up Your Email Account? You should find that you are in your email accounts management section. If you scroll down, you should find the email account. Against that record, you should see an option shown as 'Configure Mail Client' which you need to select. Scrolling down to the 'Manual Settings' heading, you will locate the manual settings required for the email account. It is recommended to use the 'Secure SSL/TLS Settings' as highlighted.